So this post falls under a category of “we probably piss people off but I don’t really care.” However, I know a lot of people, especially parents of young children, can really relate. 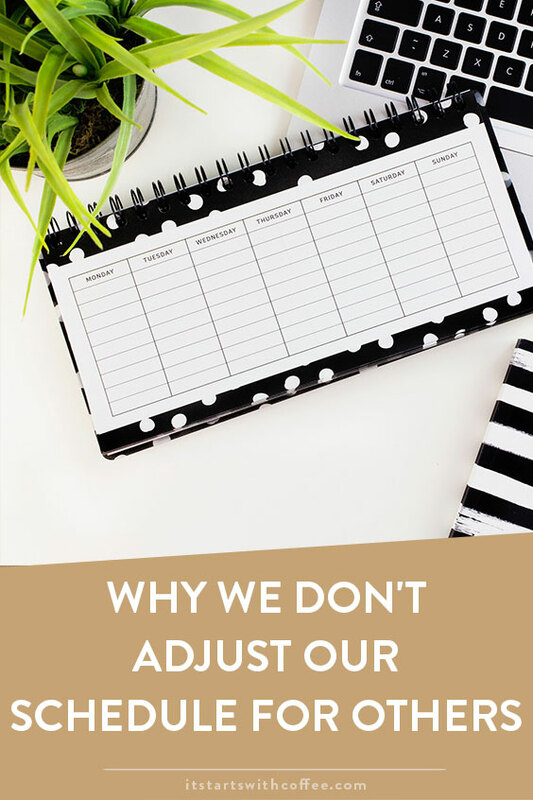 I want to talk about why we don’t adjust our schedule for others, even family. When Liam was born I knew I would be the kind of mom who stuck to schedules. I read the book, 12 Hours of Sleep by 12 Weeks, and sure enough by 12 weeks he was sleeping through the night. Once we started that program our lives revolved around his schedule. He was asleep by 7 each night, meaning if people wanted to do dinner, hang out with us etc it had to be over by 6:30 so we could get him down for the night. If our family was having a holiday or special meal we left early or did not go. It really pissed people off, but you know what we did not care. We don’t adjust our schedule for others because Liam is our priority and his schedule completely affects his mood/sleep for days ahead. Back then he also took two naps a day and that meant a lot of times not going to morning play dates or seeing friends for lunch etc. Now he takes one nap a day and on the days he’s not in school we are pretty strict about it give or take 30 minutes. His sleep though, that is a non-negotiable. Sometimes if it’s a family dinner I will go and Andrew will put Liam to bed. Or if one of us has a guys/girls night out. If we have a date night usually we put him to bed first. If you aren’t a parent you probably do not care about this but if you are or you plan to be one day you may understand. Kids need sleep, they need routine. They thrive off of it. Sure if we are traveling everything gets thrown out the window but if we are able to stay on our schedule/routine we do. While I am not a mom I definitely can relate. At the end of the day you need to do what’s best for you and if you over-promise to others it becomes hard to make you and your family happy. You definitely have to do what works for you in terms of raising your family… Our daughter never had a schedule, with the result that she is now pretty flexible on what happens when, which suits our lifestyle – but it wouldn’t work for everyone! Every parent and child is different. As a mother of three, I’ve learned that the hard way. The first was on a perfect schedule, the second had his own schedule that we had to stick to that was different than the older childs schedule etc. We ended up having to do a family schedule that worked best for us as parents and made it work for the kids. I’m with you on this, and I’m taking it a step further now that my kids are getting a little older. I’m over trying to accommodate other people when it’s not the best thing for my kids. My son does so much better on a routine. Actually so do I. I need to say no more often. You have to do what works for you. And it definitely sounds like it works very well for you. And that is what matters. I have always been strict about my boys’ naptimes (when they still napped) and bedtimes. They will be up at 6:30 am no matter what time they go to bed, and will be cranky if it’s too late. My family didn’t fully understand until the boys stayed with my parents for a week and they had the full crankiness going on when they let them stay up late! I’m a parent but to teenagers and I had to learn everything the hard way. I was always amazed when things were perfect schedule are great but life is so unpredictable. I always focused on ways to make a cushion with whatever happens. I agree completely with you. It is 2018 you have to do you first. I don’t have kids but I do have a schedule and I stick to it. I’ll adjust an hour here or there depending but it’s not something I enjoy doing and I am so grateful to have such a schedule! I’m not a parent, but I understand because my nephews and niece get very cranky if they don’t have their regular nap time. You have to put your son’s needs first! Very interesting read. I defiantly believe in creating and maintain a balanced routine. It has done a lot for me, even as an adult. My kids are all grown ups now but when they were young, I made sure the schedules we agreed upon were followed to the letter. Children are creatures of habit and any disruption in routine will give rise to a scenario that will make me go crazy. Thankfully, that worked for both parties. They have incorporated the habit of having schedules too now that they are young adults. schedules can be good on one hand but bad on others as you say . I think this is great, and I totally agree with you! I wish my in-laws were more respectful of our schedules – if they had their way, whenever we visit we would sit down to dinner after the girls’ bedtime! Parenting is tough enough that we all have to follow our own lead. I didn’t take any of the draconian advice given about sleeping for our babies, we did our own thing and I have zero regrets. This is such an amazing post of why you should not base your schedule around other people. I am so guilty of doing this!